The pole Galaxies and Cosmology includes a group working on the cosmic microwave background (CMB), who has a major role in the Planck mission, another group working on the standard model of the Universe, the inflation theory compared to observations. Another team studies through numerical simulations the epoch of reionization of the Universe (EoR), and in particular the preparation of SKA (Embrace prototype, key projects on pathfinders, etc..). Pioneering work has been done on cooling flows and the presence of cold molecular gas near the brightest cluster galaxies. The nature of dark matter, and investigation on alternative theories of modified gravity have been probed through galaxy dynamics and observations. 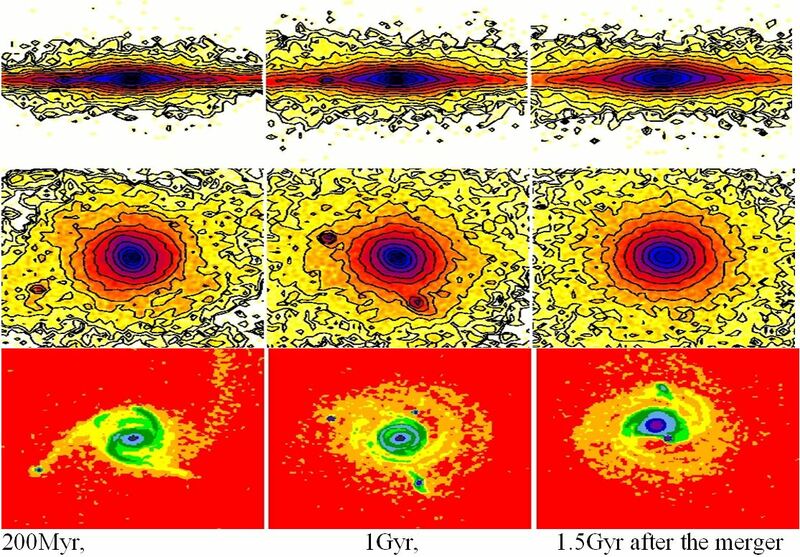 A thorough study of AGN fueling and feedback has been carried out, addressing black hole growth history and galaxy evolution. 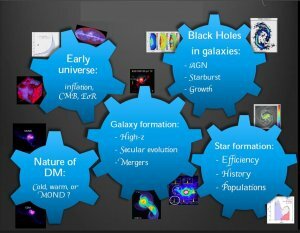 Another team works both on the observation of local galaxies, the physics of galaxies in clusters, galaxies at high redshift, and on the dynamical theories for the evolution and formation of galaxies, on large-scale star formation and the cosmic star formation history. Multi-wavelengths observations are used extensively, in the millimeter and centimeter with the instruments of IRAM, the VLA and now ALMA since 2011-12, infrared and far-infrared with the satellites Spitzer and Herschel, optical and near-infrared with the CFHT and ESO. Team members are leaders in key programs, such as the NUGA consortium on the IRAM interferometer, the consortium PrimGal on the VLT, or major programs at IRAM (which will be completed by NOEMA in the near future) on distant galaxies, and the observation of galaxies at large z with APEX, Plateau de Bure and ALMA, which data are now frequently arriving to the various groups. One group is actively preparing for the SKA. One specialty of the pole is also heavy numerical simulations, and the team competed at a very high level in the HORIZON project program of formation of galaxies in a cosmological context. 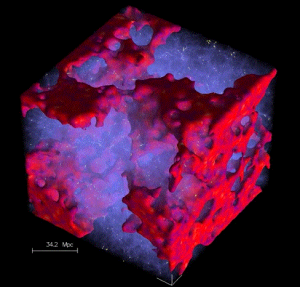 Always larger and more impressive simulations are now going on with the supercomputers at GENCI (Curie at CEA, IDRIS, CINES), and locally use of the meso-center and local momentum cluster is favoring the exploitation and post-processing. The satellite Planck was launched in 2009, and successfully mapped the Cosmic Microwave Background until its Helium 3 reserve was exhausted, in January 2012. Five full surveys of the sky were performed in 9 bands covering the 30 GHz – 1 THz frequency range. One of the members of Pole 1 is the HFI Instrument Scientist and belongs to the Planck Science Team who leads the scientific activities of an international team of more than 250 scientists. LERMA has actively contributed to Planck, and in the first place to the design, test and calibration of the HFI instrument, but also to the identification and correction of systematic effects induced by instrumental imperfections. LERMA also brings its expertise to the interpretation of the non-CMB observations produced by the multi-frequency instruments, and especially those of the interstellar medium, its polarized and unpolarized radiation. This includes large contributions to the writing and internal reviewing of about 80 "Planck papers" already published by the end of 2013. In the framework of the Standard model of the Universe the team develops highly predictive theoretical approaches combined with real astrophysical/cosmological data. The main developments by the team are: The formulation of inflation as an effective theory in the Ginsburg-Landau spirit combined to the CMB+LSS data with the results: (i) naturally very small couplings (no fine tuning) in the inflaton potential. (ii) scalar spectral index ns-1, ratio r of tensor to scalar fluctuations and non-gaussianity all of order 0.04-0.05, running spectral index of order 0.0001. (iii) energy scale of inflation 0.7 1016 GeV at the GUT scale. (iv) early fast-roll era with imprints on the low CMB multipole/quadrupole suppression, tensor and re-ionization polarization spectra. (v) ns and r inside an universal banana region with the prediction 0.02 < r < 0.05. (vi) the preferred inflaton potential is a double well (new inflation) and the r most probable value r = 0.04, which is border line for Planck and motivates present and future CMB experiments. All the CMB data till now, including the very last ones, confirm the predictions made by team with the WMAP+LSS data set. (vii) Account for the neutrino masses and types in the CMB+LSS data analysis, an important issue of high current interest (cf Destri, de Vega & Sanchez 2010, 2011, 2013). Our scientific activity on the Epoch of Reionization (EoR), both predictions of the 21 cm signal and simulations of primordial galaxies, is a direct result of the groundwork on the simulation code LICORICE. With the help of S. Baek (former PhD student) and P. Vonlanthen (former post-doc), we have made LICORICE one of the best current tools to study the EoR. Validated in Iliev et al. (2009) for the coupling of ionizing UV to the hydrodynamics, the code has been further improved since then. Transfer in the X-ray band, and in the Lyman series lines has been added, and a mixed MPI plus OpenMP parallelization has been included in 2013. This opens up the possibility to run very large simulations on thousands of computing cores. The 21 cm signal emitted by the still neutral regions of the IGM during the EoR is very weak (104 weaker than foreground emissions). However, during the very early stage of reionization, the signal may be observed in absorption against the CMB, with an amplitude potentially 10 to 20 times larger than later on.. In Baek et al. (2009) we presented the first predictions in the absorption regime including the 3D transfer in the Lyman band (Wouthuysen Field effect). In Baek et al. (2010), by adding the transfer in the X-ray continuum, we presented predictions for the 21cm signal for different source prescriptions, varying the relative amount of stars and X-ray sources (quasars, etc...). A major impact of this work, along with analytical and semi-numerical works by other authors, was to induce a change in the design of the SKA, extending its observing range to higher redshifts and thus enabling it to observe the signal in the absorption regime. In Zawada et al. (2014) we study how observing the EoR through the 21 cm signal on a light cone produces anisotropies during specific stages of the EoR only. Self-consistent simulations of primordial galaxies are difficult, because they require both the coupling of hydrodynamics and ionizing radiative transfer and a very high resolution. But only such simulations can teach us about the production rate of ionizing photons and what fraction escapes the intra-galactic medium to reach the IGM and participate in the process of global reionization. In Hasegawa & Semelin (2013) we perform such simulations and show that photo-heating has an impact on the star formation rate not only, as expected in low mass galaxies (less than 108 M), where the gas is photo-evaporated from the galaxy, but also in more massive galaxies where the clumping of the gas is partly prevented and thus star formation is quenched. The hot gas in clusters of galaxies, emitting in X-rays, is the component that dominates the baryonic mass, especially in rich clusters where it represents 10 times the mass of the galaxies. The cooling time of this hot gas is greater than the age of the universe, except at the center of the cluster, where the density of the gas is higher. Cooling flows are then predicted at the center of some rich clusters, and in general focusing on the brightest cluster galaxy, the central cD galaxy. The X-satellites Chandra and XMM have highlighted this phenomenon, and also showed that the quantities of gas in cooling were smaller than expected, because of a negative reaction or feedback phenomenon: the gas falling towards the center feeds an active nucleus in the cD Galaxy, which then emits radio jets, heating up the medium and stopping or regulating the cooling. Our group has performed the first detections and mapping of molecular gas in BCGs (Salomé et al., 2003, 2004). When resolved, the cold gas lies in very extended filaments (50 kpc), see for instance Salomé et al., (2006, 2011). For the first time, the association of cold molecular gas with the cooling flow, and the ionized gas seen in Halpha, was demonstrated in one of the closest cluster of Perseus (Salome & Combes 2004, Salomé et al. 2006, 2008, 2011). The cold CO gas is kept at large distance from the centre, in general on the edge of the cavities formed in the hot gas by radio jets. Numerical simulations of the process of cooling, regulated by the central AGN radio jets, have been proposed. The phenomenon under consideration here is the rise of bubbles of hot plasma, through buoyancy, and the compression of the gas at the edges of the formed cavities, which helps the gas to form cooling flows into thin filaments towards the center of the cluster. These hydrodynamic simulations with high spatial resolution, succeed to explain the observations of CO and Halpha (Revaz et al. 2008). They show a new effect of the AGN feedback, not only negative but positive this time. Filaments around BCGs have a peculiar optical spectrum. They are also very bright H2 emitters with high H2/PAH ratios. The source of excitation cannot by the UV-radiation from young stars. Two scenarios are mostly being studied: (i) kinetic energy dissipation by shocks, like in MOHEG (Molecular Gas Emitting Galaxies) radio-galaxies, see Nesvadba et al. (2011) and (ii) accelerated particles (cosmic rays, hot X-rays gas) ionization and heating. Recent work observed molecular gas around AGN in radio-galaxies where the first scenario seems to stand. The team also observed the Crab Nebula Supernova remnant that is a nearby place where highly energetic particles could heat the cold gas (second scenario). The H2 molecule has recently been detected in the Crab but not the low-J CO emission lines (Loh et al. 2011, 2012; Salomé et al. 2013). The Herschel key-program on cooling flows allowed to highlight gas cooling through the lines of CII, OI, and compare them to the CO component. The brightest cluster galaxies have very little dust (Edge et al 2010, 2012, Mittal and al 2011). The derived line diagnostics are like typical star forming galaxies. Large scale mapping of Perseus and Centaurus were even possible and showed different line excitation conditions for those two objects (Mittal et al. 2011, 2012). In the case of Centaurus, in order to explain the atomic and optical spectra, another source of heating than the one provided by PDR and HII regions is required (i.e. cosmic rays, shocks or reconnection diffusion). Important masses of dust have been detected with Spectral Energy Distribution and total IR luminosities typical of local star forming galaxies, with SFR 1-50 Msun/yr (Edge et al. 2010, Tremblay et al. 2012). Cooling flows are now actively studied with ALMA (McNamara et al 2014, Russell et al 2014, David et al 2014). The dynamics of galaxies has been studied under modified gravity frame and MOND in particular, during the PhD thesis of Olivier Tiret. A multi-grid code was developed to treat this non-conventional and non-linear dynamics. Numerical simulations have shown that the formation of bars in this model was easier than in Newtonian dynamics with dark matter. The frequency of bars corresponds then better to observations (Tiret & Combes 2007, 2008). However the dynamical friction is much lower in this new model, and the merger time-scale between galaxies is much longer. Simulations of interactions of galaxies show that it is however possible to form tidal tails and even some tidal dwarfs, which reproduce satisfactorily the observations. Dynamics of satellites, and the phenomenon of ‘External Field Effect’ in MOND, have also been studied in detail and resulted in several publications (Tiret et al 2007). It was shown that the MOND model was consistent with the hypothesis of dark baryons in the form of cold molecular gas, with a H2/HI gas mass ratio of 3 (Tiret & Combes 2009). On the other hand, the motion of the satellites at large scale in the SDSS can be reproduced by MOND (e.g. Combes & Tiret 2009). The kinematics of polar ring galaxies can naturally be explained by MOND (Lughausen et al 2013), while the standard model has to rely on cold gas accretion with dark matter. Another alternative to the standard model of Cold Dark Matter (CDM) has been developed by members of the pole: the hypothesis of Warm Dark Matter (WDM, with masses at the kev scales, Sanchez et de Vega , 2010-2014). 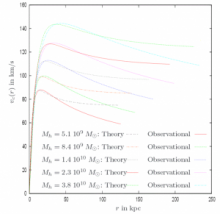 The mass of the DM particle and the decoupling temperature Td are obtained by matching the theoretically computed galaxy surface density to its observed value. The decreasing of the phase-space density since the onset of the non-linear regime till today and the type of the galaxy density profile (cored or cusped) are obtained in this way. The dark matter particle mass turns to be between 1 and 10 keV, the decoupling temperature Td turns to be around 100 GeV. The obtained values of the halo radius, the halo central density and the halo velocity reproduce the observations within one order of magnitude while Wimps present discrepancies with the observations of up to eleven orders of magnitude. These results are independent of the particle model and vary very little with the statistics of the dark matter particle (de Vega & Sanchez 2010, 2012, 2013, 2014). The team has developed the implications of this research for the detection and signals both in laboratory and astronomical observations of the leading WDM candidate: the keV sterile neutrino. The database is now implemented by new simulations with 30 millions particles each. In particular, the evolution of the Milky Way is explored in detail (Di Matteo et al 2013). Until the observations of the team, no molecular gas was found in the center of our near neighbor Andromeda (M31), and in particular in the IRAM key survey, which was done during several years. The team has highlighted the presence of molecular gas in the centre of M31, which is crucial for the fueling of the central massive black hole, discovered with a lopsided asymmetry. Specific regions were found with double spectra with velocity components separated by more than 260 km/s, for a spatial resolution of 40pc (Melchior & Combes 2011). Several scenarios were considered for this surprising phenomenon, which can provide information on the formation of the Galaxy. After having eliminated the hypothesis of gas flows due to a possible bar, it was discovered that the involved regions were the meeting of two streams of material: one from the primary disk in the centre of M31 (already inclined), and the other from a ring of dust seen almost face-on and clearly delimited by the infrared emission of its PAH molecules detected by Spitzer. The scenario is based on the model of interaction with M32 previously proposed by our team (Block et al 2006). A panoramic survey of the Andromeda galaxy (M31) was done in the optical by the wide-field camera MEGACAM at CFH (cf McConnachie et al 2009). Loops and streams of stars are detected far from the visible galaxy; those coherent structure are almost certainly remnants of dwarf galaxies destroyed by the tidal field of M31. An improved census of their surviving counterparts implies that three-quarters of M31’s satellites brighter than Mv = -6 await discovery. The brightest companion, Triangulum (M33), is surrounded by a stellar structure that provides persuasive evidence for a recent encounter with M31. This panorama of galaxy structure directly confirms the basic tenets of the hierarchical galaxy formation model and reveals the shared history of M31 and M33 in the unceasing build-up of galaxies. An improved distance to M31, with high precision, has been obtained with cepheids by Riess et al 2012. The cepheids, mostly detected from the Canada-France-Hawaii Telescope POMME Survey, were observed in the near-infrared by the Panchromatic Hubble Andromeda Treasury Program using the Wide Field Camera 3 (WFC3) on the Hubble Space Telescope (HST). The combination of HST’s resolution and the use of near-infrared measurements provide a dramatic reduction in the dispersion of the period-luminosity relation over the present optical, ground-based data. The M31 distance can then be determined within 1%. The result is also in good agreement with independent distance determinations from two detached eclipsing binaries allowing for an independent calibration of the Cepheid luminosities and a determination of the Hubble constant. The nearby galaxy M33 allows to better understand the physics of dust in a galaxy poor in metals, the rate of star formation, the small scale of the interstellar structure (Kramer et al 2010, Boquien et al. 2010, 2011, Verley et al. 2010, Combes et al. 2012). In particular, power-spectra of the emission by Herschel over the whole galaxy allow us to discover the threshold scale at which the 2D dynamics of the plane leaves place to the 3D turbulent behavior. How active galactic nuclei (AGN) are fueled in galaxies, and how the energy generated by the active nucleus can in turn regulate gas accretion? This has important implications for the co-evolution of galaxies and black holes, which is observed through the now well established M- relation (e.g., Gultekin et al 2009). The invoked dynamical mechanisms depend on the scale in question: at 10 kpc scales, torques are produced by galaxy interactions and mergers (e.g., Hopkins et al 2006; di Matteo et al 2008); at kpc scales, bar instabilities, either internally driven by secular evolution or triggered by companions, can first feed a central starburst and then fuel the massive black hole (Garcia-Burillo et al 2005). At 300 pc scales, the ``bars within bars’’ scenario (e.g., Shlosman et al 1989), together with m=1 instabilities, takes over as a dynamical mechanism. 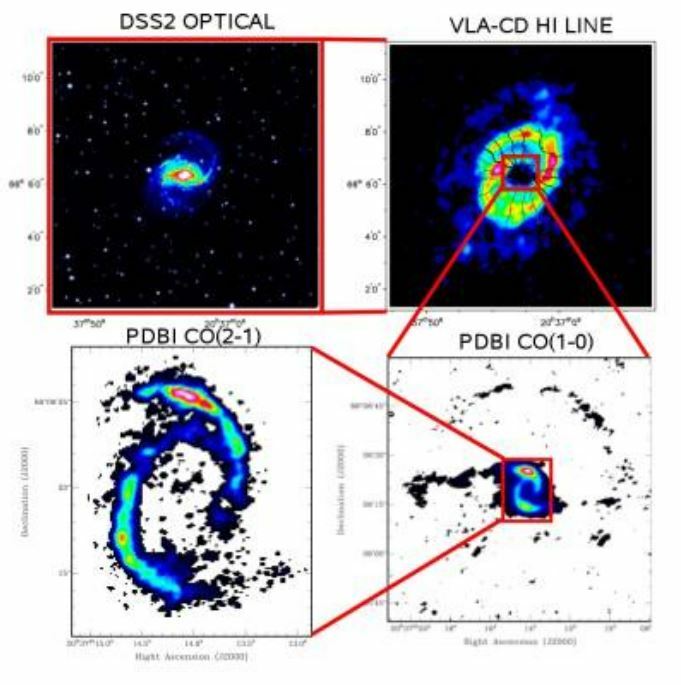 Our IRAM-PdBI observational program NUGA (NUclei of GAlaxies) has revealed smoking-gun evidence of AGN fueling only in one third of the galaxies observed (Garcia-Burillo & Combes 2012). This might be due to nuclear star formation or AGN feedback driving gas outflows that stop the fueling; galaxies will then undergo successive periods of fueling and starvation, and might be found in a feeding phase at 300 pc scales only one third of the time. Other mechanisms could contribute to the fueling, especially towards the center of galaxies: viscous torques, from dense gas in regions of large shear, or dynamical friction of massive clouds against the old bulge stars (e.g. Combes 2002, Jogee 2006). AGN feedback has also been studied through molecular outflows (Dasyra & Combes 2011, 2012,; Dasyra et al 2014, Combes et al 2013), and numerical simulations of the radiative driving of outflows in AGN and starbursts have been performed (Novak et al 2012). 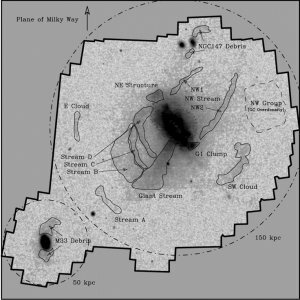 The brightest starburst galaxies (ULIRGs) were selected in the redshift range 0.2 to 1, particularly poor in observations of the CO molecule for technical reasons. This epoch is extremely important, because it is in this second half of the age of the universe that the cosmic star formation drops by an order of magnitude, and the star formation efficiency declines, without their causes being identified. Through a large survey of 70 galaxies, both with the 30m and PdB, it has been established that the gas fraction of galaxies evolve very quickly in this intermediate redshift (Combes et al. 2011, 2013), and the efficiency of star formation could come from this, together with galaxy interactions, as in more local starbursts. Members of the team actively participate (co-PI) to a Large Program at IRAM (30 m and PdB) in order to better study “normal” massive galaxies forming stars in the main sequence (and non-ULIRGs), in intervals of redshift around 1 and 2 in HST-AEGIS (+ CANDELS) fields. The first results showed that the fraction of gas was on average 34% and 44% at z = 1.2 and 2.3 respectively, which explains the formation of stars very important (Tacconi et al 2010, 2013). The current and future mm-submm facilities give a direct access to the molecular content of the first galaxies in the Universe. Those objects are very dusty and have very high star formation rates (100-1000 Msun/yr). Recently the very famous object BR1202-07 was resolved and appears to be a merger of at least 2 objects at a redshift of 4.7 (Salomé et al. 2012). This object is very likely composed of even more sources. BR1202-07 is thus probably one of the first cluster/protocluster of galaxies in the Universe. 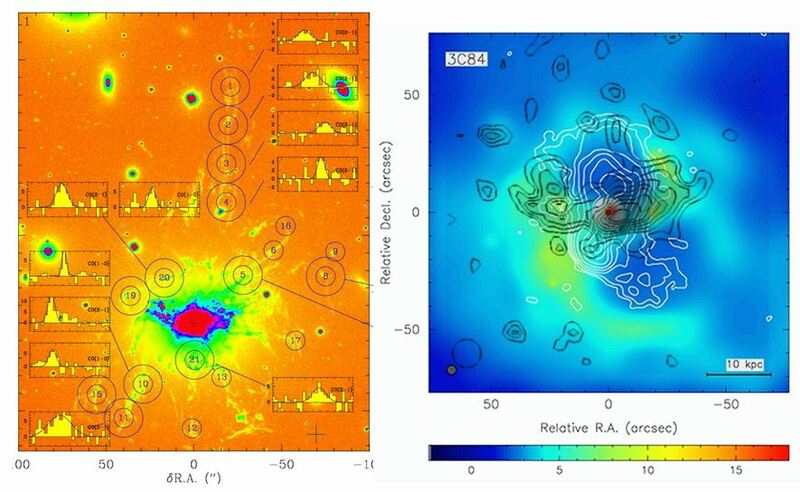 Finally, the team is observing galaxy clusters as gravitational telescopes, which amplify background galaxies, and allow the study of ’normal’ galaxies at large redshift, impossible to observe in otherway (Egami et al. 2010, Zemcov et al 2010, Rex et al. 2010, Boone and al 2011). The group has in particular recently discovered high-z galaxies, with spectral energy distribution highly shifted to the red, invisible in the optical, and were able to determine their redshift only with CO lines (Lestrade et al 2010, Combes et al 2012). This work is actively continuing with ALMA.